If you remember on Instagram, my sister-in-law and I found some “holiday” tablecloths on crazy clearance and I was thinking of using them in here – as you can see I have 2 choices pinned up. 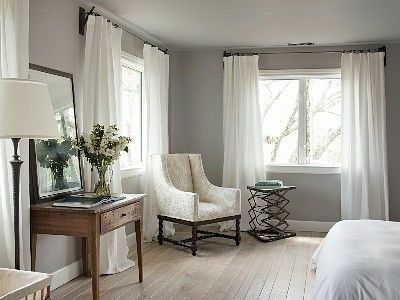 I still love the pattern, but for a master bedroom I am still drawn to serene, clean, calm looks. I’m leaning towards the Ikea whites…what about you? We just put up white curtains in ours. It is nice and calming! I'm a white curtain girl myself! I like white but I yearn to go outside my normal pallette. I have the Ikea white linen curtains, and I highly recommend them. I spent more on the rods, hooks and rings than the curtains. The pattern is lovely. It breaks up the solid colors and adds interest that is pleasing to the eye. Maybe white in the spring/summer (lots of color outdoors) and the pattern during the fall/winter (when everything outdoor is so bland). I have those exact tablecloths as curtains in my master. My room is awaiting a paint job. It's currently a goldish mustard color (like that when we moved in) and the curtains tied that color along with my white bedding together. Congratulations on your mention on Domino.com! The one with the pattern. I love white drapes as well. We have them in our bedroom and family room and they give off a light and airy serene feel. They are actually $5 flat sheets from Walmart but you would never know! I definitely vote for the IKEA whites.